Ziembski Cheers. 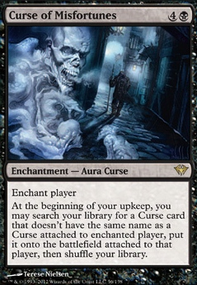 Might have thought of Curse of Oblivion as a way to get around graveyard decks, though Agent of Erebos is the better answer. I'll give it a try replacing it with Land Tax. I guess You don't need that Curse of Oblivion, it doesn't do much. You might fit Land Tax in. To start off, the Energy counter cards (Live Fast and Die Young) need to go. Energy counters don't help any of the cards in your deck. Curse of Oblivion doesn't work with the other cards. Try to make this deck focus on one concept instead of a bunch of them. JustcallmeSoul on Cursed into Combo Hell. I added some of your recommendations (and now my own deck is out of my budget, but i'll figure that out somehow) I did keep 2x Curse of Oblivion in the sideboard, to bring in vs dredge and delver combos. I also stuck to my guns with 2x Bitterheart Witch in the sideboard, to bring in on a game 2 vs something that doesn't appear to be playing alot of counter magic. 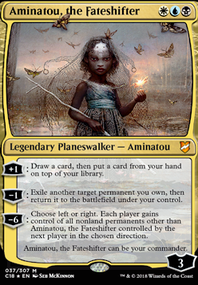 still looking at Duress and/or Thoughtseize to cover for my bigger late game curses though. Tinselteeth on Cursed into Combo Hell. Ran the deck through a couple tests against Delver Prowess and Superfriends. Delver Prowess stuck a creature, then held up countermagic for your expensive Curses (Remand REALLY hurts!) while Superfriends simply solitaired into a T4 Doubling Season, T5 Ugin ulti. The biggest problem your deck has is early game. You don't have any early interaction mainboard. I recommend finding space for at least 4 Bolts main (they're in the SB now), preferably 4 Bolts + Victim of Night. 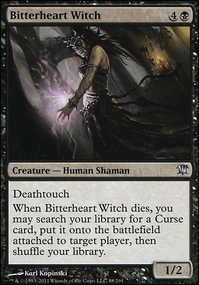 Cut both Curse of Oblivion (cute, but you're not milling) and both Bitterheart Witch for starters. 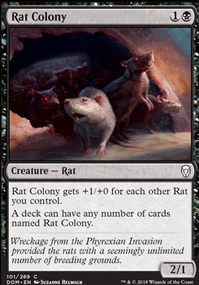 You may go as far as cutting your entire creature package for removal. Some sort of boardwipe will also go a long way. Damnation is the cleanest answer (but expensive!!! ), but even an Anger of the Gods will go a long way. 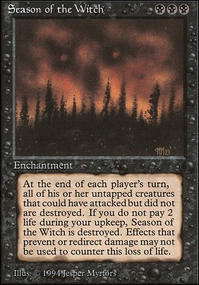 TLDR: You need early game interaction and/or mid-game board wipes to ensure you survive long enough to play your powerful Curses. Hope this helps! maybe you could add some curses? Infectious Curse, Curse of Oblivion, Curse of Death's Hold, Curse of Misfortunes, and Curse of Thirst. 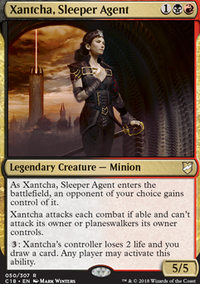 This would take the deck in a completely different direction though.